Sea Otter Awareness Week is drawing to a close, but—lucky for residents and visitors—sea otters live in Morro Bay year-round. This story could have been different; sea otters were once hunted almost to extinction for their thick pelts. (They have about one-million hairs per square inch, which helps keep them warm in our cold waters.) They were so scarce that they were thought to be extinct along the California Coast. However, one small group of otters survived along the coast of Big Sur; this group was first sighted in the 1930s. The otters that you see in Morro Bay today are descended from this population. Thanks, in part, to their protection as threatened under the Endangered Species Act in 1977, their numbers have begun to rise. Sea otters are also covered by the Marine Mammal Mammal protection act. Protections like these, along with an increased understanding of what sea otters need to survive and thrive, has helped them make this recovery. 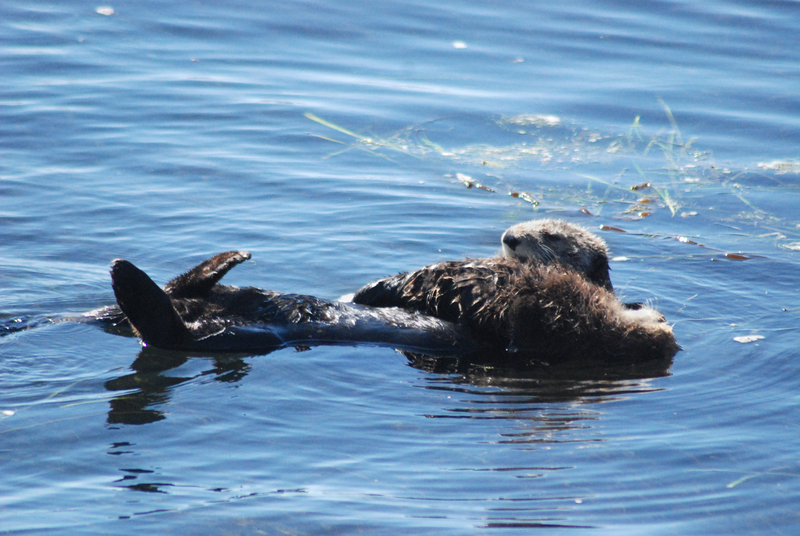 Sea otter populations have increased statewide. 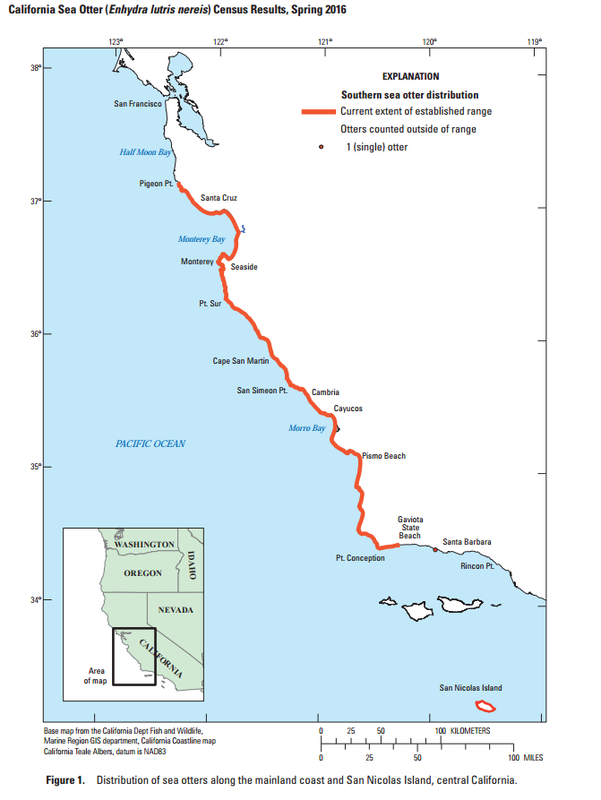 The USGS California Sea Otter Census counted over 3,500 individuals in the mainland Southern sea otter population, which stretches from just south of Halfmoon Bay to right around Gaviota State Beach. An additional 100 plus sea otters live farther south on San Nicolas Island, as the result of a translocation program that ran from 1987 through 2012. 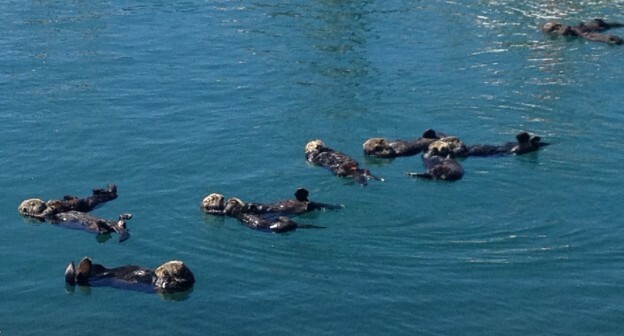 Prior to 2010 there were typically fewer than 10 sea otters in Morro Bay. In May of 2016, a record 36 adults and 9 pups were counted. Statewide, an average of more than 3,000 otters have been counted for the past three years. A mother sea otter and her pup float on Morro Bay above a seagrass bed. As part of Sea Otter Awareness week, you can head down to Target Rock (on the south end of the Morro Rock parking lot) and take a closer look at the furriest of bay residents through spotting scopes and binoculars provided by California State Parks. State Parks docents will also be available to talk with you about sea otters, their history, and how you can help them stay and thrive in Morro Bay and beyond. This event runs from 10 a.m. to 2 p.m. Growing otter populations are great for people looking to catch a glimpse of these adorable furry mammals and their puffball pups, and they’re even better for the health of Morro Bay. As a keystone species, otters help keep other populations in balance. For example, otters eat sea urchins, which eat kelp. (Sea otters’ teeth can take on a purple stain because of their sea-urchin-heavy diet.) If sea otters are not there to keep the sea urchins population in check, kelp forests can struggle. Sea otters can also help seagrasses. Here, the chain is a little more complicated. Sea otters eat crabs, which eat sea slugs. Sea slugs eat algae off seagrass blades, which helps to keep them healthy. Without sea otters to eat the crabs, crabs would eat the sea slugs, leaving fewer of them to help clean the blades of the sea grass. The video below shows what can happen when sea otters are reintroduced to an area. Give otters their space: While sea otters may look like they’re lounging, being an otter is hard work. Much of their play-like behavior—rolling over, rubbing their fur, and licking themselves—is necessary to keep them buoyant and warm. If they aren’t grooming or sleeping, they’re likely to be hunting. Otters need to eat 25% of their body weight each day in order to generate enough energy to keep going in cold water. This is especially true of mother sea otters (sometimes called sows), who have to hunt for themselves and their pups. The caloric demand is so great for mother sea otters that they can raise only one baby at a time. You can help these mothers and babies out by observing this beautiful animals from a distance. This way, rather than worrying about a possible threat and missing out on a chance to catch her next meal, the mother otter can spend her precious energy keeping herself and her baby fed and groomed. If you see someone who is harassing a sea otter, you can call the Morro Bay Harbor Department at (805) 772-6254 and report the problem. Pick up after your pets: Toxoplasma gondii is a parasite that infects many animals, especially cats. The eggs can live for months or years in feces. Unfortunately, this parasite can be fatal for sea otters. To reduce the risk of infecting sea otters, you should always pick up after your dogs and cats (both indoors and out). Make sure to throw cat waste and litter in the trash, rather than flushing them down the toilet. Waste-water treatment processes do not kill Toxoplasma gondii. Report stranded or dead otters: If you see a struggling, stranded, or dead sea otter, please call the Marine Mammal Center at (415) 289-SEAL (or 7325). They will help the animal, if possible. They also work with researchers who study the causes of death and disease in sea otters in order to better understand the threats these animals face. For more information about how to help sea otters, check out Sea Otter Savvy’s website. Subscribe to get the Estuary Program’s blog delivered to your inbox each week! Donate to help the Estuary Program protect and restore Morro Bay.